This product I found in Canada at an Asian market and is in Hong Kong. At first bite, there is definitely a bacon flavor, it almost reminds of bacon popcorn or even bacon salt. As you can see from the picture above, the crips are shaped and colored to look like fried bacon with a whole lot of fat. 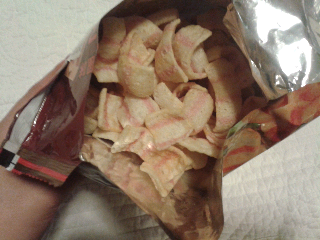 The texture is like pork rinds/chicarrones?sp? which makes sense if this is an entirely pig/pork type of product. I'd say this isn't for the faint of heart, or adventurous types, or people bad with odd textures. It is almost like you are biting into fried pieces of bacon fat. 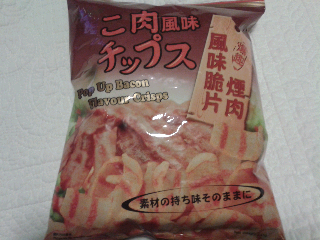 My cousin was with me when we tried it and he said it does taste like bacon, but he couldn't do more than one piece. I, however, love this type of stuff and weird/odd things and found it quite addicting. 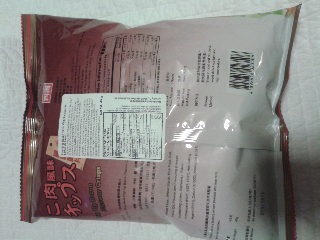 For an Asian snack, it reminded me more of a Western snack.